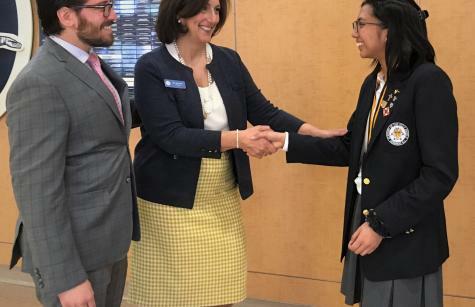 Everyone at Holy Angels knew Czarina Alfonso would receive a silver medal when she became New Jersey’s top high school youth volunteer in the 2019 Prudential Spirit of Community Awards program, but the administration kept the exact date and time to themselves. Alfonso was pleasantly surprised at the Academy’s April 4th assembly, when Principal Jean Miller announced that a guest was on hand to honor a student. Alfonso was called to the stage to accept her medal from Prudential representative Phillip Shetsen amid enthusiastic cheers from her peers. Czarina is being recognized for her outstanding work with “Give it a Shot,” the non-profit pneumonia vaccination program she established for children in the Philippines. While visiting the Philippines during her summer vacations, Alfonso noticed that many people have a difficult time accessing health care. After she learned that pneumonia is a leading cause of death in the Philippines, she began to raise funds to vaccinate daycare-aged children against this ailment. Some parents walk for hours to ensure that their children can attend Alfonso’s clinics. As the state honoree, this motivated Clifton resident will receive $1,000 and an all-expenses-paid trip to Washington, D.C. She is also being considered for one of 10 national awards. National honorees receive $5,000, a gold medallion, a crystal trophy for their nominating school or organization, and $5,000 grants for the charities of their choice. Due to the number of volunteer hours Alfonso has invested in her program, she has also qualified for the President's Volunteer Service Award.